Here’s a fact: nobody welcomes a new season quite like the fashion world. Ever fashion house, brands and shop is doing its very best for you to know that they have the must-have IT trend of the season.For us fashion bloggers summer officially arrives when our inbox gets filled with summer fashion lookbooks and store visit invites. While browsing through the various summer lookbooks sent my way, I stumbled upon Promod's summer collection. To be honest, I have known about Promod but never really noticed it before. Out of curiosity I gave it a look, and I am glad I did. While going thorough their summer collection, I not only found some stunning, drool-worthy pieces, but I finally discovered Promod. From classic to bright coloured jeans, floral print shirts and white lace trimmed tunics to printed dresses and everyday tops; Promod’s new collection is a fine mix of timeless must-have summer staples and the latest trends of the season. While the entire collection is filled with standout pieces, my personal favourite's are the denim shirts, the splash effect floral print top, delicate white tunics/blouse with embroidered lace and embellished mini skirts. The beauty of Promod Spring-Summer 2013 collection is, that most of the pieces can be worn in the day and with a few add-ons be transformed into night-out ensembles. What I really liked about Promod Spring-Summer 2013 line, is that they have managed to create a collection that provides the modern women with affordable, sophisticated and easy-to-wear fashion. Nice post. 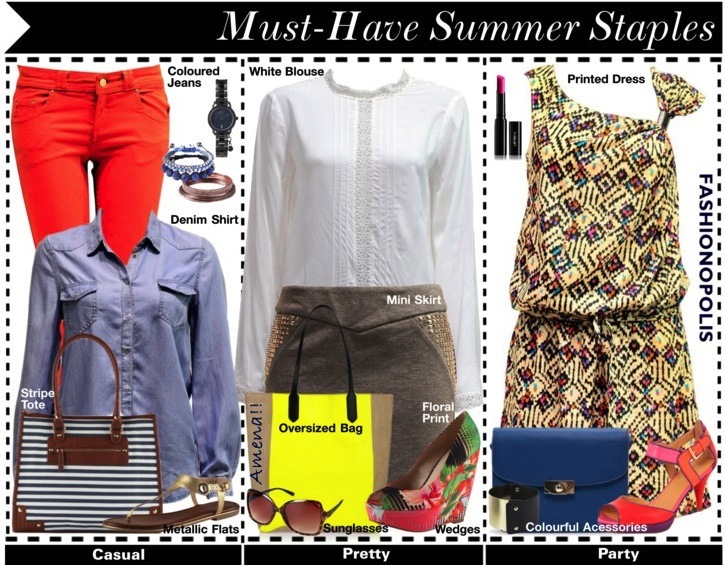 I am especially drooling over the denim shirt but a little skeptical if it'd be comfortable to wear them in summers. promod has some surprisingly good pieces..and if you look closely they have slightly cheaper stuff too..(cheap is relative here of course)..i have not bought anything from them yet but soon..
Love all of these pieces, and I totally agree that they're great wardrobe staples. The printed dress I'd probably switch out for something a little brighter, but other than that a great selection. It's the time of summer so wear a cotton outfits for better comfort. Hi, can i buy kurtis from your website? Very Classy and elegant Charles and Keith Bags indeed ...sometimes less is more and in this collection everything’s restrained, relaxed and – even better – comfortable, with a pulled-together elegance ! !